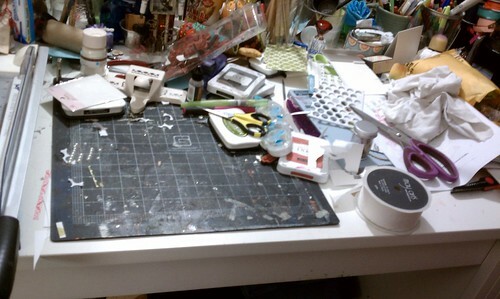 Just Jingle: What's On YOUR Workspace Wednesday and a Winner! You know...a few things here..a few things there.. basically LOTS OF THINGS EVERYWHERE! HA! HOWEVER....the most exciting part of my workspace this week is the addition of a couple of VERY fabulous items due to my awesome family and my birthday! What is that, you ask? 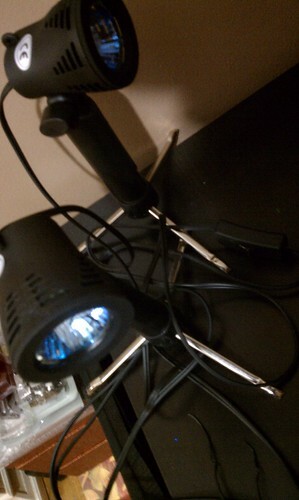 Well, those just so happen to be the photo studio lights that go with my new at-home studio! It's a fabulous collapsible light box, complete with backdrops, tripod, lights, and fabulous storage!!! I have to move a table around in my room to get it set up and play with it a bit to learn how to properly use it, but I am SO excited!!! I've wanted one of these for a long time! I'm giddy!!!! The Hubbums looked through several options before deciding on this one and he chose SO WELL! I love it!!!! As for this pretty little card, well, I created it with the Scrapbook Circle Remember This kit and the amazing printable that is included with the kit purchase! I LOVE this printable!!! Polaroid frames. Need I say more? LOL! This one was featured on the Scrapbook Circle blog yesterday along with a layout made by one of the other DT members using the printable in awesome ways! This kit is seriously amazing! Congratulations, Erin! Please email me with your full name and address so I can send you your stamps and your gift card. I'm going to politely ignore the fact that it appears you are a Giants fan, k? K. Thanks. HA! So...now THAT is all for today! To check out more awesome workspaces head on over to The Stamping Ground! 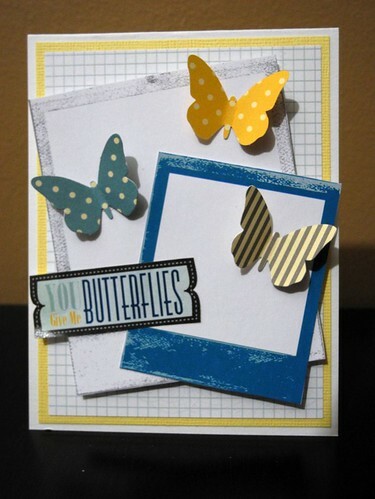 love that butterfly card!! just way too cute! That desk organization looks familiar. I get to the point where all my work surface is covered and I have to use a tray in my lap! great card! Can't wait to see how your light box works! Card is awesome, SO excited and jealous about that Grand Calibur, and wow! you are gonna have fun with your photo lights set up!!! I would be excited about those goodies too!!! Cute card !! have a fun day!!! Hooray for the Grand Calibur!!! Super Cute Card! 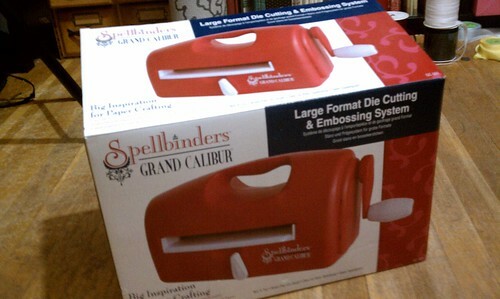 woohoo congrats on getting a spellbinder Grand Calibur...have fun creating.. I love the Polaroid cut out, so cute! Super birthday gifts! Lucky you. Hope it was a great day as it really sounds. Thanks for popping by my blog and I've put you in the scarf draw! Just got to finish the edges, tassels and beads now! And sweet card. Saw it on the SC blog! can't wait to see what you produce! Too much fun on those perfect birthday gifts! Enjoy and cute card. Happy late Birthday! I hope you find the time soon to play with your new toy!! I love the card!!! Very pretty card! I can't wait to see the things that you will make with your Spellbinder. wow you had some great presents Jingles, they look wonderful. Beautiful Card amazing colors. Congrats to Erin for winning and have fun playing with all your new toys. Very cool card--and I'm envious of the GC--I've been starting to wonder if I NEED something like that myself. woohoo, what a birthday, hope you enjoy playing with the GC! and your studio will be fabulous! I am tempted to get one for my birthday, hubby is always asking me if I need something crafty! Happy Birthday and have lots of fun playing with your new Grand Caliber. That light box system looks awesome. I really need to invest in something similar as my work space has glare from the overhead lights and no natural light (basement room. I love the look of your lights...does it come with a collapsible tent type structure to place the items you wish to photograph? And maybe a tripod too? I have been eyeing up some different ones but can't decide. wow you did have an awesome birthday...and I always loved your photos ...been wanting to forever make one of your light boxes ....shame on me...it will be exciting to see your photos now! loveee your card pretty paper! Happy belated birthday. You got LUCKY and are blessed, that's for sure. BTW, how did you get the numbers back on your posts? Mine went away when Blogger changed something and I can't get them back. I am SO THRILLED you got the GC - you WILL LOVE IT!!! If you have any questions, shoot me an email, 'K! But don't ask me what die templates to get because my answer will always be ALL!!! LOL! Can't wait to hear your review on the Grand Caliber. Lovely card! Love those butterflies! Wow, birthdays are cool, eh?! Oooh, what absolutely fabulous gifts you have received! And yes, these pesky jobs out in the so called "real world" do get in the way of playing with our toys sometimes, lol! Hubby gets big points - you will LOVE the light box! Happy Belated BD Jingle!!!! Woo Hoo! Awesome BD toy! Looking forward to what all you will share:) Great card too.